Click the Menus link in the Appearance menu in your Dashboard. 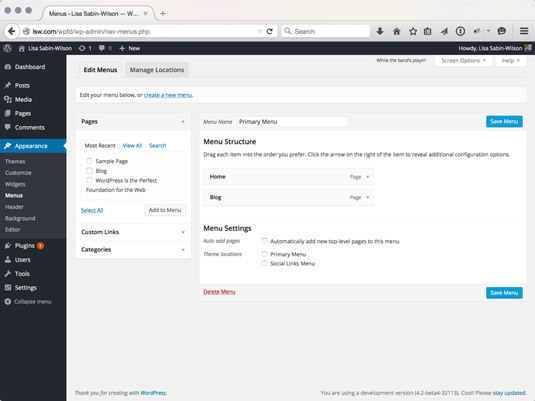 The Menus page opens in your WordPress Dashboard. Custom Links: In the URL field, type the URL of the website that you want to add (https://www.google.com). Next, type the name of the link that you want displayed in your menu in the Label text field (Google). Then click the Add to Menu button. Click the Edit link to the right of the menu link name to edit the information of each individual link in your new menu. The Custom Menus options on the Menus page in the Dashboard. Notice in the HTML markup that the first line defines CSS ID and class: <ul id=“menu-main” class=“menu”>. The ID in that line reflects the name that you gave your menu. This assignment of menu names in the CSS and HTML markup is why WordPress allows you to use CSS to create different styles and formats for your different menus. When developing themes for yourself or others to use, you want to make sure that the CSS you define for the menus can do things like account for subpages by creating drop-down menu effects. You can do this several different ways. The example below is a block of CSS that you can use to create a nice style for your menu (this CSS example assumes that you have a menu named “Main”; therefore, the HTML and CSS markup indicate ‘menu-main’).